Noank Baptist Church dates back to 1843 when a number of Noankers' decided it was too far to climb to the top of Fort Hill for church services every Sunday. Since that time, the church has had a distinguished history of ministering to the village and surrounding community through its outreach ministries, music programs and community involved ministers. 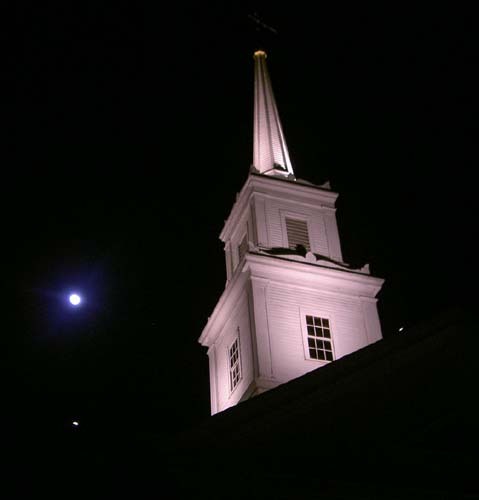 The Meeting House is a classic New England church, white with a lit spire that serves as a landmark to local fisherman and sailors. The sanctuary seats about 350 and is open with tall, clear-paned windows. The lower ground level contains four Sunday School rooms, (two of which are used during the week by the Noank Baptist Church Day Nursery School), a kitchen and a vestry that seats about 125. The Meeting House property includes two beautiful gardens: the Biblical Herb Garden and the Memorial Garden. The Biblical Herb Garden contains plants found in the Bible, offering beauty and a meaningful way to appreciate biblical references to ancient plant life. A guide for the garden is available here as well as from the church office. The Memorial Garden was developed to provide a final resting place for the cremains of church and community members. A brochure about the Memorial Garden is available here as well as in the literature rack with more information about this ministry of the church.